There is a real feel good factor when you paint subjects like this. To draw or paint anything you have to spend a long time observing it. Eventually you learn to do this by looking just for shapes and lines and proportions in a sort of detached (I like to think professional) fashion. It is a way of drawing what is actually there rather than what you think is there. But then when you start to add the paint the subject stops being lines and shapes and becomes itself again. On a really good day it feels like the painting is talking to you. Or in the case of these cuties, perhaps just grinning at you. 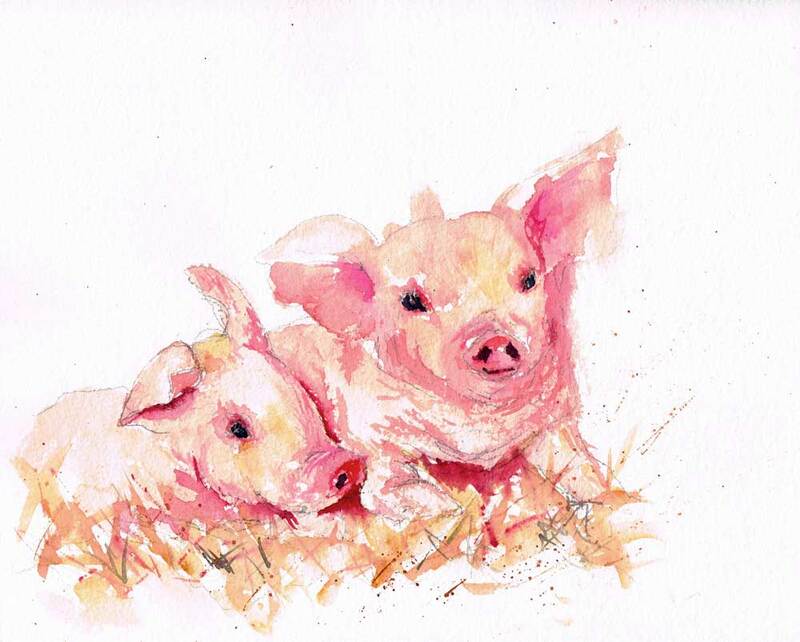 Piglets are irresistible, aren't they? I had so much fun painting those two in the straw I had to do some more. These three just look like naughty children, right? I think they are my favourite of the series. I think that is what Miriam meant when she talked about the spirits of the farm animals. I think I had to set about painting them to discover that. I love that idea. When I saw this chap looking back at me all I could think of was that turn of phrase that I haven't heard for a very long time - 'making sheep's eyes', as in making sheep's eyes at your beloved. Like this... Awww. When it comes to large, romantic eyes, you can't go overlooking cows. All those lashes! And in this one I even got out my lovely new masking fluid pen... don't think I will ever go back to fluid that you have to apply with a brush ever again. I used it to mask out the grass seeds in the foreground so that I could paint them in at the end over the grass without the underlying grass wash changing the colour. 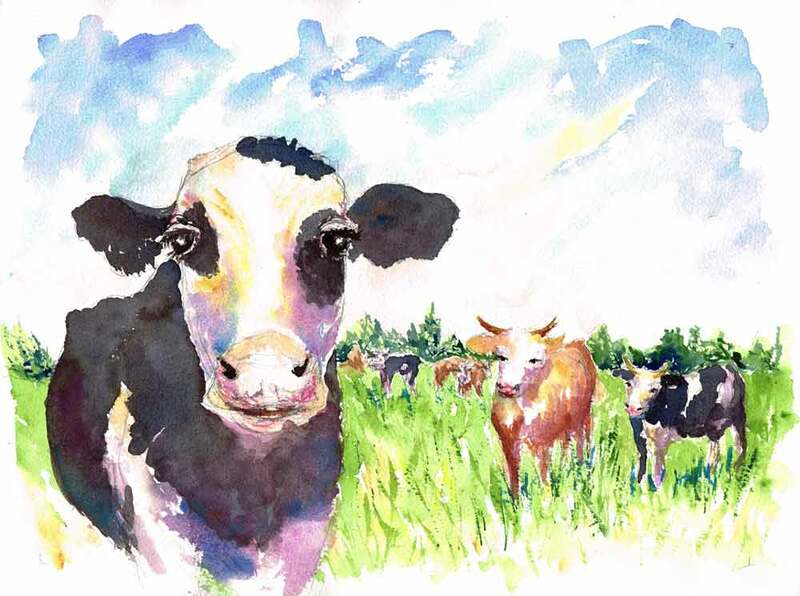 I didn't think I would every feel like I had done a proper job of a series of farm animals without including a rooster. 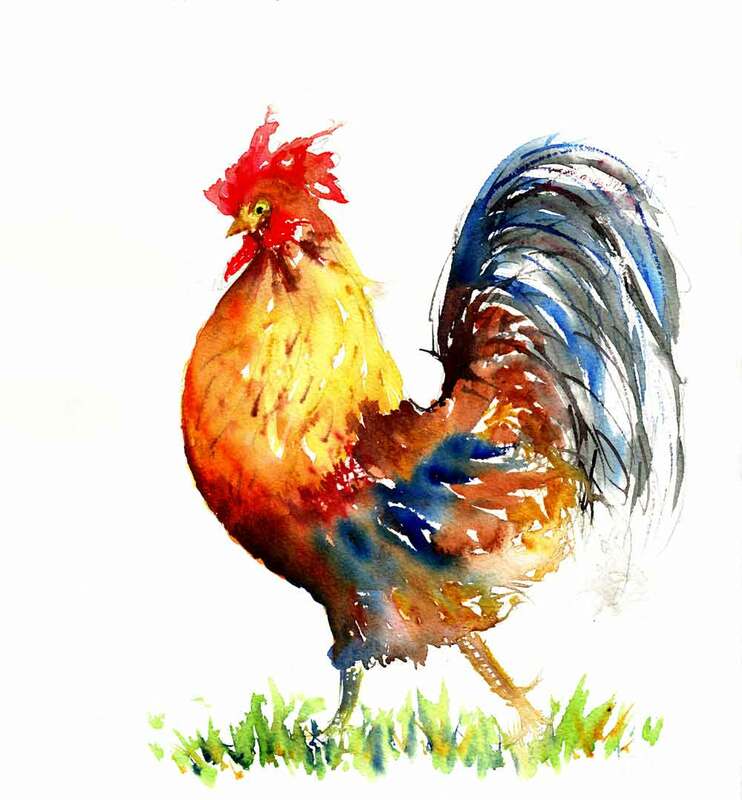 I was about as pleased with this painting as this rooster seems to be with himself. I loved using my new favourite wet in wet technique which seems to capture the light on the feathers in such a lively, joyful way. Maybe I should do a whole series of roosters? So much happy colour in these birds. I also ended up doing a bit of research on the wattle and comb (as you do....) Did you know there are actually researchers who study chickens and wattles? Well, anyway, they showed that the hens all show a clear preference for the rooster with the largest wattle and comb, who waggles it about the most.